I’m glad that the goat was invented, because I love goat cheese. Isn’t it beautiful? I wonder if it’s really that starkly white or if the dairy industry universally takes all color out of it. They make American Cheese yellow, so what’s preventing them from whitening some cheese? It’s whiter than the white tablecloth and white china. 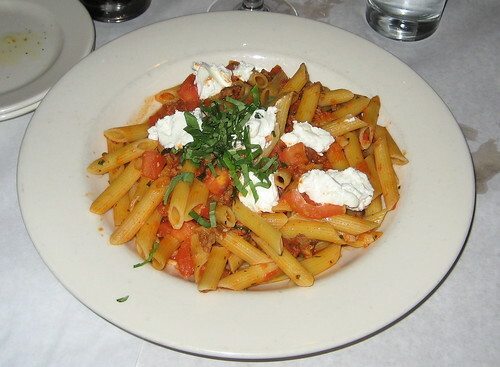 Pictured is the penne pasta with goat cheese and sausage from Scoozi. It had some tomatoes and spices tossed in also. When I got it, I stirred it up so that the goat cheese melted and created a tart, creamy tomato sauce. I wonder if that’s what the chef expected. I love burying my face in a plate (or bowl) of pasta. This was a two-looker. That means I looked up twice while I was shoveling it in, once to tell my wife I loved her, and once because I thought she was trying to take some. That means I liked it. A one-looker is very rare and is reserved for something very special, like some pasta with pancetta. I’ve never had a no-looker, but there’s always tomorrow. Scoozi is part of the LEYE group of restaurants. They do it right and I rarely have an issue with an LEYE restaurant. Except for Maggiano’s, where they just give you too damn much food, it’s a waste. Well, thanks for hanging with me. Posted in food on 2007/05/23 by John.